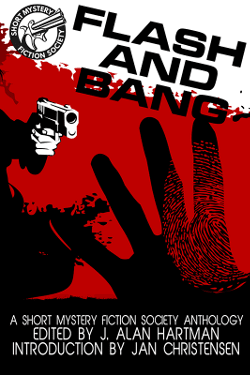 OCTOBER 8, 2015 - Untreed Reads has published Flash and Bang, the first Short Mystery Fiction Society member anthology, in paperback (ISBN 9781611878295), large-print paperback (ISBN 9781611878998), and ebook. Member and Untreed Reads editor-in-chief Jay Hartman called for unpublished mystery, suspense, or thriller stories containing either a "flash" or a "bang". Limiting submissions to one flash (300–1,000 words) and one short (1,500–3,000 words) per member, Jay received more than 300. Individuals: If you purchase the paperback ($16.00) and ebook ($4.99) at the same time from the Untreed Reads Store, the ebook cost will be subtracted from your total. Retailers and Libraries: All Untreed Reads print editions are available to be ordered through Ingram or printed through Espresso Book Machine. Ebook editions may be purchased at 200+ retailers and library distributors. If you are unable to obtain an ebook edition through your preferred retailer, please contact Jay Hartman (JHARTMAN at UNTREEDREADS dot COM). By purchase order: Complete the Winter 2015 catalog order form (Pages 49–51) and email to Jay Hartman or fax to (866) 946-5364. You will receive a complete quote before order is finalized. By credit card or PayPal: Email JHARTMAN at UNTREEDREADS dot COM or phone (510) 861-0663. Reviewers: Email Jay Hartman for ebook review copies. If you decide to review or carry copies of Flash and Bang at your bookstore or library, feel free to comment below. We're glad to steer readers your way. The image will link to this post, just like the image in the right sidebar of this blog. Email news for next month's post to G_SO at YAHOO dot COM.